So the question is, according to LDS beliefs, doesn’t this mean Mr. Nelson will be a polygamist in heaven? Furthermore, isn’t he a polygamist now though he is currently only living with one of his two wives? Apparently, there is now an online petition calling for the elimination of Apostle Nelson’s name from the Letter from America’s Religious Leaders in Defense of Marriage produced by the Religious Coalition for Marriage (see Mormon Church Joins Coalition in Defending Marriage). “It is deceptive of Elder Nelson to sign a petition that defines marriage as the union between one man and one woman when he practices a theology that extends the name ‘marriage’ to a union between a man and multiple women,” [Connell] O’Donovan’s petition states. As a religious doctrine,…the principle remains unequivocally in place, said Mormon historian and author D. Michael Quinn, who has written extensively about polygamy. Except for the fact that two concurrent marriages while both wives are still alive is currently not allowed in the LDS church. The protester seems to have forgotten this issue. Nelson and the coalition are attempting to define marriage “in this life” and “in this country” not for the eternities, which is in the realm of an altogether different government. Logic, please look up an informal logical fallacy called, “missing the point.” You just committed it. It is hypocritical for a man who believes he is married to two women *at the same time* to sign a petition to define marriage as something between ONE man and ONE woman. It matters not that one of those women is dead. Elder Nelson believes he is married to both of them now. The LDS Church had no comment. 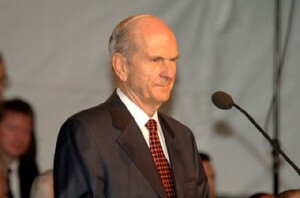 This entry was posted in Uncategorized and tagged Marriage, Polygamy, Russell M. Nelson. Bookmark the permalink.